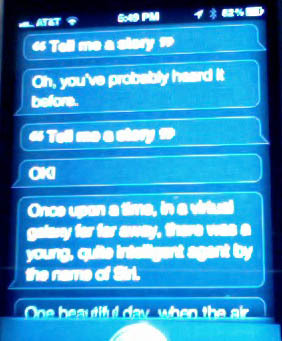 I asked Siri to tell me a story…. 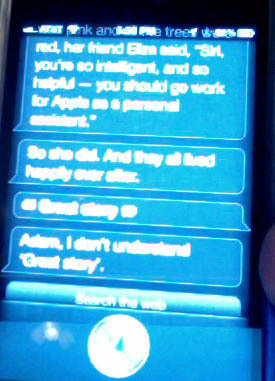 I asked Siri, my (and everyone else’s) iphone 4s personal assistant to tell me a story. ME: Tell Me a Story. ME: Tell Me a Story! 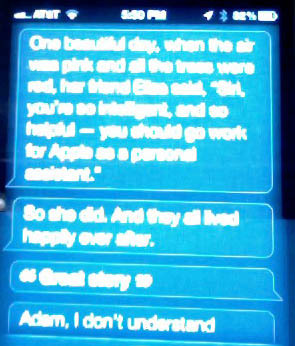 Once upon a time, in a virtual galaxy far far away, there was a young, quite intelligent agent by the name of Siri. So she did. And they all lived happily ever after. Next post: First Snow of the Season!